A Japanese professional wrestler-turned-lawmaker will visit North Korea next week, his secretary said Thursday, as attention was focused on the Pyongyang antics of eccentric ex-basketball star Dennis Rodman. 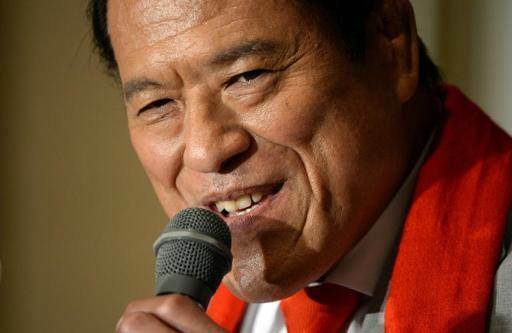 Antonio Inoki is a frequent visitor to the reclusive communist state. During his last trip in November, he met Jang Song-Thaek, the uncle of young leader Kim Jong-Un who was purged and executed last month. Inoki, an opposition member of the upper house, is head of a non-profit organisation aimed at establishing sports-based exchanges, which opened an office in Pyongyang last month. “We don’t know until we arrive there who the senator will meet with – that was always the case in his past visits to North Korea,” his secretary said. “His talks with North Korean senior officials are likely to take up diplomacy through sports, and the possibility of other Japanese parliamentarians visiting the country,” he said. Former NBA star Rodman on Wednesday publicly sang “Happy Birthday” to Kim, a man he says he loves and has called a “friend for life”. Footage of the bizarre spectacle showed the heavily tattooed Rodman gesturing to the crowd while uncomfortable-looking retired NBA team-mates clapped along. It emerged hours after Rodman sparked fierce condemnation in the United States when he appeared to imply, during a rant on CNN, that imprisoned American missionary Kenneth Bae deserved his fate. While Inoki is a colourful character by Japanese political standards, his visit is expected to be considerably lower-key than Rodman’s. Inoki, a member of the tiny opposition Japan Restoration Party, was suspended for a month from the legislature for visiting Pyongyang without parliamentary permission while the house was sitting. The planned trip, which begins on Sunday with a flight to Beijing before a Monday departure for North Korea, does not require parliament’s approval because it is in recess. He is scheduled to return to Tokyo next Thursday, the secretary said.